I’d like to start with some numbers. Up to last March I was averaging 1 hit per day. So far this May, I’m averaging 100 hits per day. I started up jamesrovira.com using WordPress.com in December of 2011. I wasn’t too committed to it at the time: I just wanted a place that I could use when I wanted it. From Dec. 2011-March of 2013 I had 718 hits, or about 45 a month, for a small handful of posts. Then in April I decided to get a bit more serious about blogging. I tried to post something every day. It wasn’t hard, because I didn’t always have to come up with brand new content. I’ve been publishing on the web off and on since the 1990s, so when I didn’t have new content to add I’d gather my previously published works and link to them from here (I didn’t want to just republish them here out of deference to my original publishers). I also started using LinkedIn, Facebook, Google+, and Twitter as platforms to promote my blogging (I’d forgotten about my Tumblr page so I’m just starting to use that). LinkedIn is the main hub here — I’d find groups that fit my content, join the group, and then once I published a blog I’d post notice about it to my LinkedIn page and to the most interested groups (and no, I don’t just spam groups — I try to promote my content within group interests). As of May 17th, 2013, I have 2171 hits, or 1,756 in about a month and a half, or about 40 a day. 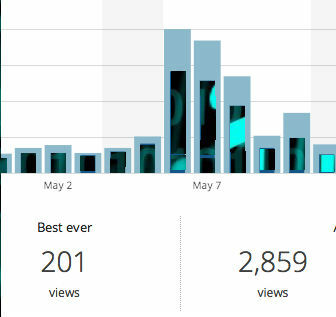 So I went from about 45 hits a month to about 40 a day (1200 hits a month) just by promoting my blog on social media. But, WordPress data reveals that the real spike occurred after about a month of blogging: I averaged a bit more than a hit a day until this April, then about 15 hits a day in April, and now about 100 hits a day in May. LinkedIn and WordPress itself seems to be my biggest helps, at least going by WordPress’s own data. Dec. 2011-March 2013: 718 hits, or about 45 a month, or about 1.5 per day. April 2013: 462 hits, or 15.4 per day. May 2013: 3412 hits, or 110 per day. 718 total hits at the end of March 2013, but surpassed the 5,000 hit mark on June 2nd, 2013. I do my own image editing. I use Pixlr editor, a free app that you can install directly into your Google Chrome browser. It performs basic functions well. I have a tablet that I need to set up, but for now I’m just editing with my trackpad. I used it to create my logos and whatever other images with effects that you see on the site, such as my modifications to the cover of Baudrillard’s Simulacra and Simulations. I use Grab on my Mac to create new images like the one up above and then Pixl Editor to modify it as I have (the base image is a screenshot of my WordPress data). Going cheap with image editing software means a few steps (1. Grab image, save as .tiff file 2. Open in Preview, export as .jgp 3. Open in Pixlr Editor to edit), and it means having fewer tools, but if you’re just getting started, that’s a good way to go. So — use social media. Use it considerately, though. Don’t just spam. Meet people at their areas of interest. I rarely post links to my blogs to any of the listservs to which I’m subscribed, at least not unless I have fairly rich content or specific information that I know will be of interest to the group. When I do post to listservs, though, I do get a spike in hits. Reblogged this on Simon Hamer. You look like you’re doing great to me… 168 hits and you just put the site up.